Kerrymaid Double has the taste of fresh cream but with added functionality for use across a multitude of applications. In hot dishes, Kerrymaid Double never splits when used in cooking or when used with acidic and alcoholic ingredients. 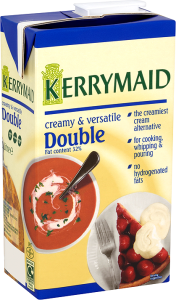 Kerrymaid Double reduces like fresh cream, and is bain-marie and microwave stable in sauces. When whipped, Kerrymaid Double is more stable than fresh cream and whips up to 3 times its own volume. Kerrymaid Double can be stored at ambient temperature and used in curries, sauces or as a dessert filling or topping. Kerrymaid Double is also the healthiest cream alternative on the market, lower in fat and saturated fat than market leaders and fresh whipping cream. Watch Kerrymaid development chef Lee Williams demonstrate the versatility and convenience of Kerrymaid portfolio through a range of different uses and professional applications.